For those of you who have come to The Shops recently and have seen a tiny little white house located behind Le Bilboquet and wondered “What is this place?” We are about to give you the 4-1-1. 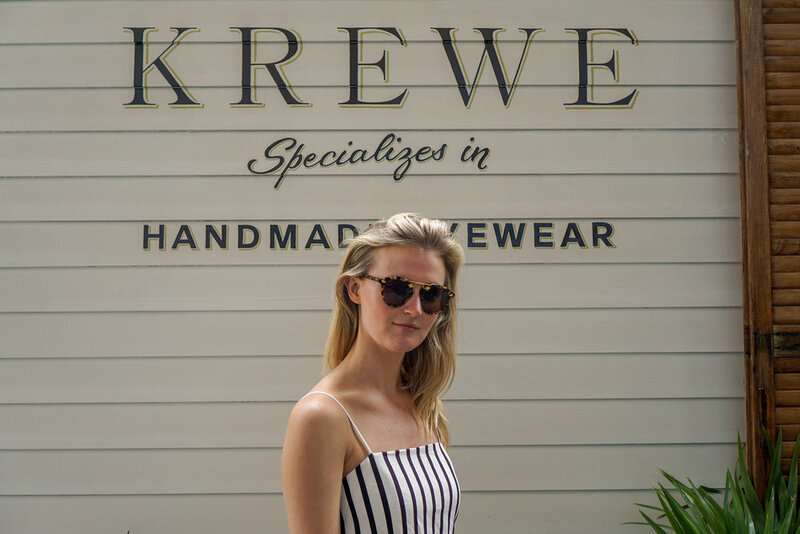 ‘Tiny House’ is the 154.8 square foot mobile retailer to the beloved New Orleans eyewear brand KREWE. KREWE sunglasses are one of the most popular eyewear brands in the marketplace. They have been spotted on many celebrities and bloggers because of their distinct look and quality. They are so confident in the quality of their sunglasses that they have a quality guarantee. This means that if you break your shades or glasses, they will replace them, no questions asked! How amazing is that? KREWE is sold in many retailers across the country, but we feel special that ‘Tiny House’ has made its way over to The Shops to showcase the true heritage of the brand. The house design was meant to give a truly authentic look and feel of New Orleans’ distinct architecture and its Afro-Caribbean lineage. The Tiny House is traveling all over the country and will be parked at The Shops Buckhead Atlanta until May 13th. We sat down with team KREWE to learn more about the brand and why they chose Atlanta as one of their KREWE destinations. How did KREWE begin? As an artist—a photographer—Stirling Barrett wanted a way to create something tangible for people to express themselves with. Barrett was born and raised in New Orleans. He went to college in Dallas post-Katrina and returned shortly after, drawn back by the culture of New Orleans, and started KREWE in 2013 with the desire to do something unexpected from a place no one would expect. Can you tell us a little bit more about KREWE and it’s relationship to New Orleans? KREWE, as a word, is distinctly tied to New Orleans. The word 'krewe' is linked to the tradition of Mardi Gras, describing a diverse group of people that parade in celebration of carnival season. Our name invokes this spirit of creative collaboration. The magic of this diverse city’s rhythms and rituals informs so much of who we are, and what we create. Each frame is named after a street in New Orleans and is inspired by the spirit and soul of this place. We’d like each customer to feel a bit of New Orleans when rocking our frames. We’ve seen a lot of celebrites wearing KREWE. Can you name a few of your favorites and what style they were wearing? The first sighting of Beyonce in ST. LOUIS and Gigi Hadid in ORLEANS were such big moments for us. Since then, we've had celebrities like Kendall Jenner (WARD), Emma Roberts (CBD) and Blake Lively (STL II) to musicians like Alabama Shake's singer Brittany Howard (CLARA) to actor Edgar Ramirez (ORLEANS WINDSOR). They're all big moments for us, and we love seeing how each individual wears their KREWE. Why is team KREWE excited to pop-up in Atlanta? When it came to Tiny House, Atlanta was on the short list of cities we were interested in. It has a similar feeling and identity that relates to KREWE’s mission of doing something unexpected from somewhere unexpected, and we’re thrilled to take the Tiny House to Atlanta for the first time. What is one tip that you would give a shopper who is looking for a new pair of sunglasses? Find a shape that fits—that makes you feel the most "you"—and go from there.